We enjoyed an unusually warm autumn. There was even one or two days in early November where you didn’t even have to put a coat on. Suddenly, it got very cold during the last few weeks, and I’m back in heavy coats and hats. C’est dommage! Christmas slowly appeared this year. One by one, we saw Christmas markets, decorations, events, musicals, ice skating rinks, shopping specials… Everyone seems to be in better spirits these days. My favorite market has become more empty, with less tourists and touristy stalls. What you get instead is the real deal as Paris is left only to the Parisians. You’ll see lots of winter fruits and vegetables here… squashes, apples, pears, potatoes, turnips, and other tubular goodies. During a French winter, we eat roasts and cheese dishes (hello, raclette!). The French have winter foods down to a t. There are so many dishes meant to warm you up… and fatten you a little. And you know what, I’m totally okay with that last part. Things are slowing down and I have more time to reflect on the things I love. I’m really obsessed with the cute packaging from the markets. Look at how this cheese is wrapped up! I simply adore the little French foods printed on it. And I always welcome these cute paper veggie bags. All the vendors use these bags at the market. I try to reuse them when I go to the market. Avoid plastic bags… any bags if you can. 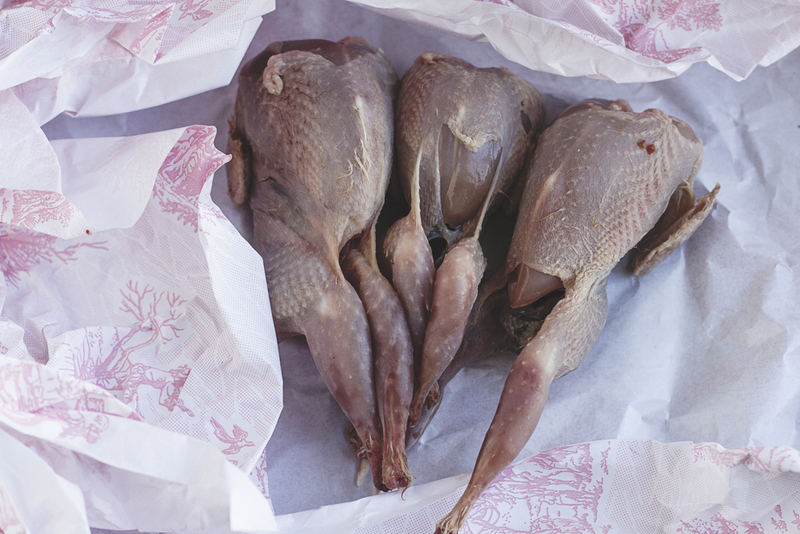 Lastly, this is what brings us here today— beautifully wrapped quails! I love the rococo-inspired pink pattern. Before cooking the quails, let’s get to the side dish first… a colorful array of baked veggies! My favorite vendor sells these intensely colored carrots. After peeling, they reveal an interesting interior— a bright maroon-red and orange center! Luckily, unlike my purple haricots, these carrots retain their color after cooking. A warning though… the carrots bleed red everywhere, kinda like the stains a beet would leave behind. I like to roast these carrots with leeks. 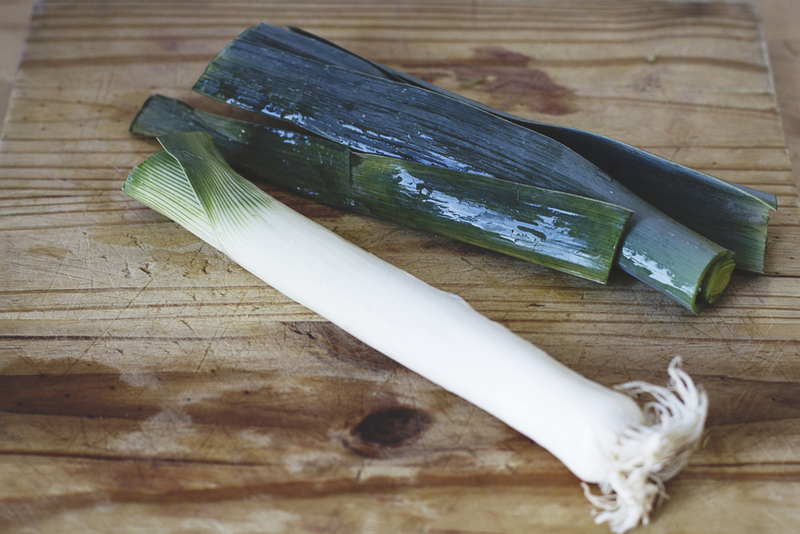 I find leeks to be extra delicious when baked… I even like them a little crunchy. Simply cut all the veggies length-wise, sprinkle with coarse salt, and bake at 200C/400F. 1. Heat the oven to 200C (F). 2. Clean and peel carrots. Cut length-wise, being careful not to make them too thick. I usually get 3 long slices out of one medium sized carrot. With the leeks, wash them thoroughly. Make sure there is no dirt hiding between the leaves. Lop off the dark green tops and roots. Then cut the leeks in half. 3. Lay the vegetables on a baking sheet, alternating as you go. Drizzle with olive oil and sprinkle with salt and pepper. You can also add in your favorite herbs like thyme or rosemary. Loosely cover the vegetables with foil and pop them in the oven. 4. 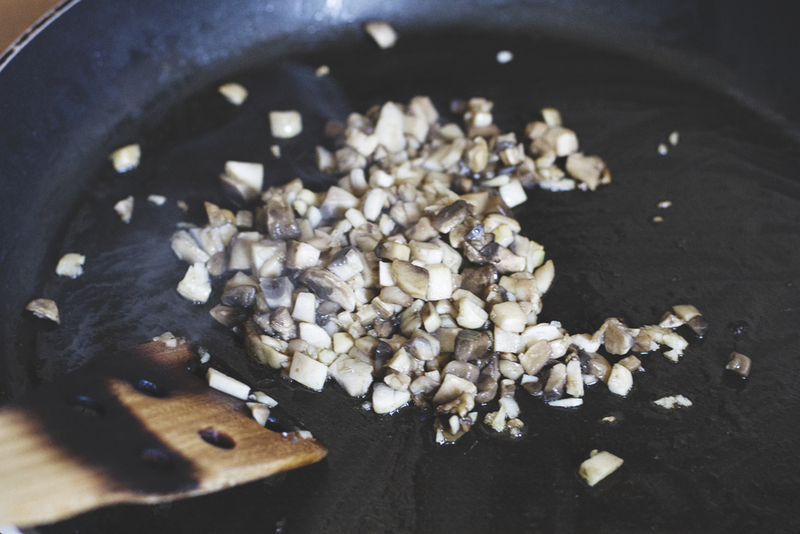 When the vegetables soften, about 6-8 minutes in, quickly take them out and add the chopped garlic. Recover with foil and continue to bake. 5. The vegetables will be ready to take out in 5 minutes. You should be able to pierce through the carrots easily. If you like your veggies to have a little crunch, remove the foil and bake for another 2 to 3 minutes. Now, onto the quails. One of my first cooking adventures was with my first ever French friend. I am very proud to have this friend as she is the only French friend I’ve made outside of Petit Copain’s circle. She is also amazing. Let’s call her G.G. Concerned about my poor American diet, G.G. invited me one day to cook French specialities. I believe it was winter time when we first made this meal. I will never forget gathering all of the ingredients and… stuffing the birds. It was a little intimate. You really gotta stick that stuffing in there. I’ll show you. Stuffing is called farce here. It’s usually sausage meat mixed with herbs, onions, and bread crumbs. G.G. liked to mix hers with mushrooms. It’s best to cook the mushrooms first and then add them to the farce. This doesn’t look so appetizing, but I promise you, farce is delicious. G.G. also gave me some amazing herbs to mix in with the farce— thyme and sariette (savory) from the countryside. I’m sad to say I used the last of these herbs in this batch of quails or caille as they are called in French. After stuffing the quails, you’ll want to sew them up. Don’t pack too much farce in there or else it won’t cook in time, leaving you with a dried out bird, raw farce, or both. Another suggestion for this recipe is to bone out the birds, which allows the farce to cook faster. Roast them with some cut up onions or whatever other veggies you like with your roasts. 1. Preheat oven to 200C/400F or as high as your oven will go. 2. Heat 1 tablespoon oil in sauté pan on medium heat. Put in the cubed mushrooms and onions and cook until soft (about 5 minutes). Remove pan from heat and let the vegetables cool off. 3. In a bowl, mix together the farce, cooled down mushrooms and onions, herbs, salt, and pepper. 4. Stuff the quail cavities with the farce, being careful not to overstuff them. You will want to leave enough space to sew the cavities. 5. Once the quails are stuffed, take the needle and thread and carefully sew the quails shut. 6. In a oven-safe dish, place the sliced onions and any remaining herbs in the bottom. 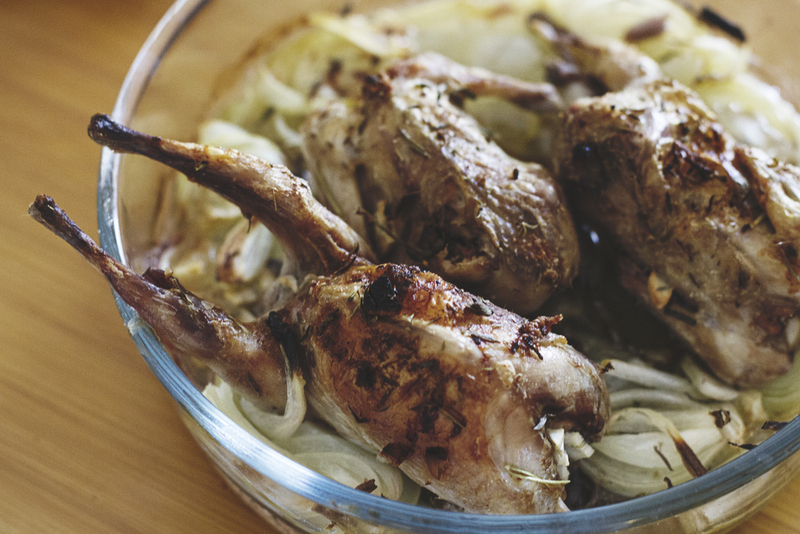 Rub the quails with the butter and a little salt, then put them on top of the onions. Pop them into the oven for about 5 minutes and then turn down the heat to 172C/345F. Bake for about 40 minutes or until the temperature of the farce reaches 76C/170F. 7. Take out of the oven and let the quails rest for 5-8 mins. Serve with vegetables and whatever grains you like! That’s all I have for today. As for next time, Petit Copain and I just moved into our first apartment together! I have so many stories about trying to buy a dishwasher in France, it’s not even funny. À bientôt!